Our livestock guardian, Reina, is one of the most loving and devout mothers I've ever known..she no doubt could've done this without me. 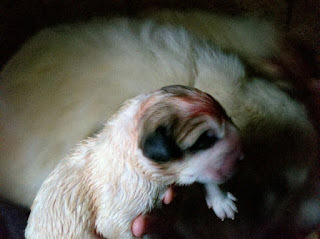 But why should she..even canines like to be have companionship and encouragement, especially during a birth. Plus I wouldn't have missed sharing these moments with her for anything in this world! Reina's den was ready the week before her due date. 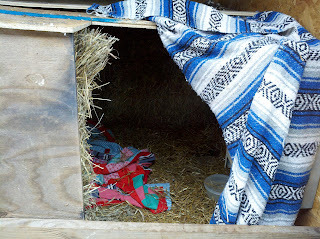 Lined with straw bales, wind proof and completely in the dry - ready and waiting for whelp day. 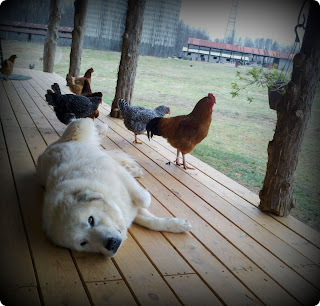 Her den is nestled among the ewe and goat paddocks with her hens roosting overhead...the perfect place for a future guardian dog to start life. January 24 - this was Reina's actual due date and she was always on time..so I knew she would likely start her laboring sometime this day. Late that afternoon, Reina started in the early phases of labor. She was my shadow and needed constant touching. She would whine, pace and pant through her contractions. Contractions were far apart but she was dilating and her discomfort was obvious. 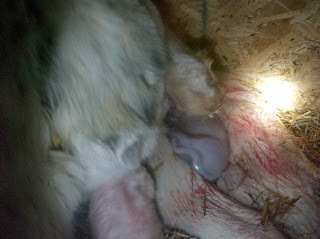 Her belly moved and kicked..the babies were doing great. I could see them settling down low in her belly as they prepared for their birth. There is nothing quick about labor and it is called labor for a reason..even for animals, it's a lot of work. During her 20 hours of labor, she ate, walked around and did many things she normally would. Except during contractions, this is when she needed extra massaging and comforting words of encouragement. I was now a midwife and most of my other duties were put on hold. 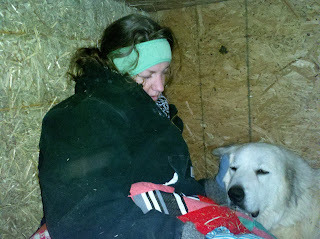 Reina labored the majority of the time in her den..and I labored with her. It was an especially cold night and there was a snow storm coming. Her den was kept dark and quiet, just the way she likes it. 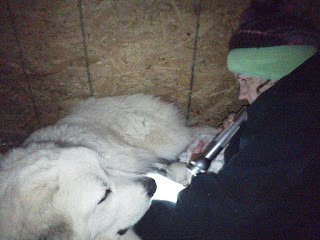 The temp outside the den dropped into the teens but it hoovered around 52 degrees inside. In between contractions she was very content and took lots of quick naps. Around 2pm on the 25th, Reina was entering into the 3rd phase of labor, she was no longer content to rest in between contractions..she was ready to meet the babies her body had been nurturing for 64 days. 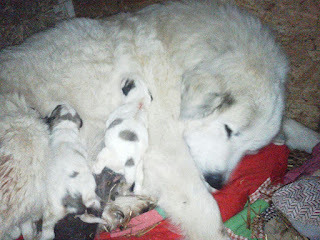 And one by one, 5 little 4-legged angels started appearing. 2 of the pups were born breech but Reina has no problems with birthing them. With just a couple pushes, each slid out beautifully. She vigorously breaks the sac. I swab out their tiny mouths and immediately clean the airways while Reina chews the umbilical chord and cleans up what remains of the sac. If Reina were not gentle in her chewing, I would cut and tie the chords off myself...but Reina does a superb job and so nature is allowed to take its course. Reina lovingly shares her baby cleaning duties with me, so I grab the towels and get to work. As each baby is rubbed and stimulated, they start squealing and rooting..instantly ready to eat! 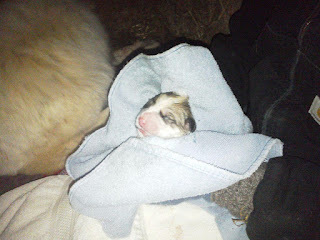 After they're good and dry, I place them back one by one next to their mama's belly. Reina lays perfectly still as the pups desire to survive drives them to find their mama's warm milk and within minutes, they're feeding. Reina looks at me..content and glowing. Her heart is overflowing. She loves being a mother and sharing in this journey with her was a privilege I'm extremely grateful for. Her joy became mine. Sweet sounds from the den!